It's no surprise that a long day at work makes fast food more tempting or that a breakup can send you straight to the loving arms of Ben & Jerry. And researchers have long known that stress can drive us to overeat, making us gain weight. But a new study from the University of Florida shows that it works the opposite way too: Your actual body fat affects the way you deal with worries—and the more fat you have, the more stressed out you feel by everyday life. We're not just talking about the alarm you feel from too-tight pants—according to the study, body fat, technically called adipose tissue, sends a signal to your brain that starts a vicious cycle where you eat because you're stressed out and then the weight you gain heightens the alarm response which leads to more stress eating. 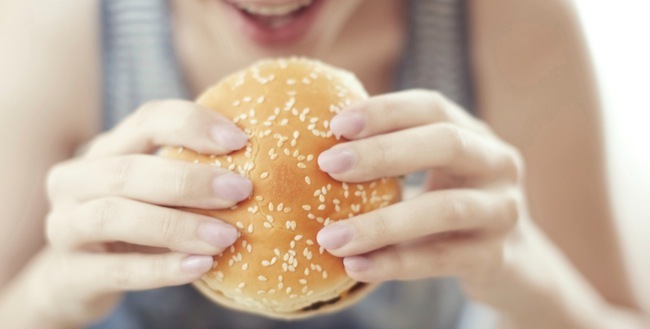 Plus, Stress Eating Can Make You Burn Fewer Calories. The study, published in Psychoneuroendocrinology, is the first to prove that emotional eating is not all in your head by showing this biofeedback loop between body fat and cortisol levels. "Before this, everyone thought that the regulation of stress was mainly due to the brain. It's not just in the brain. This study suggests that stress regulation occurs on a much larger scale, including body systems controlling metabolism, such as fat," said James Herman, Ph.D., a co-author of the paper and a professor at the University of Cincinnati. Herman believes they've found a previously unknown fat-to-brain pathway. Fat tissue has glucocorticoid receptors, which help communicate stress levels to the brain to help regulate metabolism. This can be helpful when it's telling your brain to control its stress reponses and energy balance, but, over time, the chronic bombardment of messages from the fat to slow down your metabolism can create a self-perpetuating cycle of weight gain and worry. So instead of tension simply causing us to gain weight, now our weight gain is causing us to feel more chaos in our lives. "The big question is the nature of that signal to the brain. We need to learn how to go in and break that cycle of stress, eating, and weight gain," Herman said, adding that this research could lead to better ways to help people deal with hectic events. While this news might seem depressing at first, it offers us two important clues on how to live a healthier life. According to the scientists, the less body fat you have, the less anxiety you'll feel—so it's worth it to pick up the heavy weights at the gym. Plus, the study shows the importance of breaking the stress-weight gain cycle early by taking measures to both manage weight and reduce worry immediately.